DPBF1U Series 1U front access DC breaker panels provide distribution and overload protection for 8 DC loads up to 30A. The 1RU mounting position (1.75 inches) high DC breaker panels provide 8 single bus loads or 4/4 dual-bus (A&B) loads (up to 30A max. per load). DPBF1U Series 1u front access dc breaker panels distribute up to a total of 150 amperes of load current from two separate 150A sources with true A and B distribution and alarm capabilities. A and B sections of the dual-bus panel are isolated and can be separately configured for 12, 24/48 volts and are polarity neutral. Breaker sizes are 1 to 30 amperes. Alarms are indicated by a Green/Red LED and one Form C relay contact per bus. DPBF1U Series 1u front access dc breaker panels come with brackets that permit mounting in either a 19- or 23-inch relay rack. 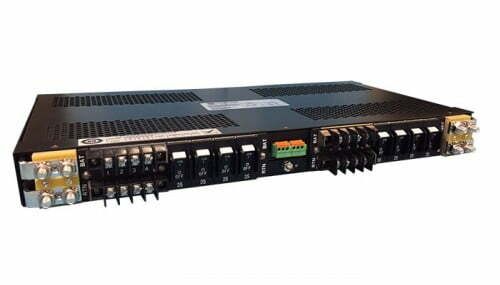 They can be mounted from the front of the rack with offsets every quarter-inch from front to back to align with existing rack-mounted equipment. Certifications UL60950-1 2nd Ed., CSA22.2 No. 60950-1 2nd Ed., EN60950-1 2nd Ed. NOTE: The above are standard configurations. The ‘x’ denotes between one and four breakers which must be specified as part of the final model number. For voltage combinations not shown see the configuration guide on the datasheet.